Unafraid to challenge themselves compositionally, The Invisible's boundless approach to arrangement flowed effortlessly between the texturally rich and the rhythm heavy, the ethereal and the visceral, taking in unique and subtle electronic dancefloor rhythms as well as deviations into experimental rock. It's a mixture that's won peer level praise from the likes of Radiohead's Ed O'Brien, Foals, Hot Chip, Wild Beasts, Anna Calvi and Everything Everything. The key sentiment behind The Invisible’s new album, “Patience,” is a sense of “joy and gratitude for being alive.” The experiences of the three members of the band since the release of their last album, both individually and collectively, mean that the group “have gained a deeper understanding of the value of life.” In some sense, you could argue that this is what music, at its most basic, does—it lifts us up, it celebrates, it is a distillation of the very best of life and living. 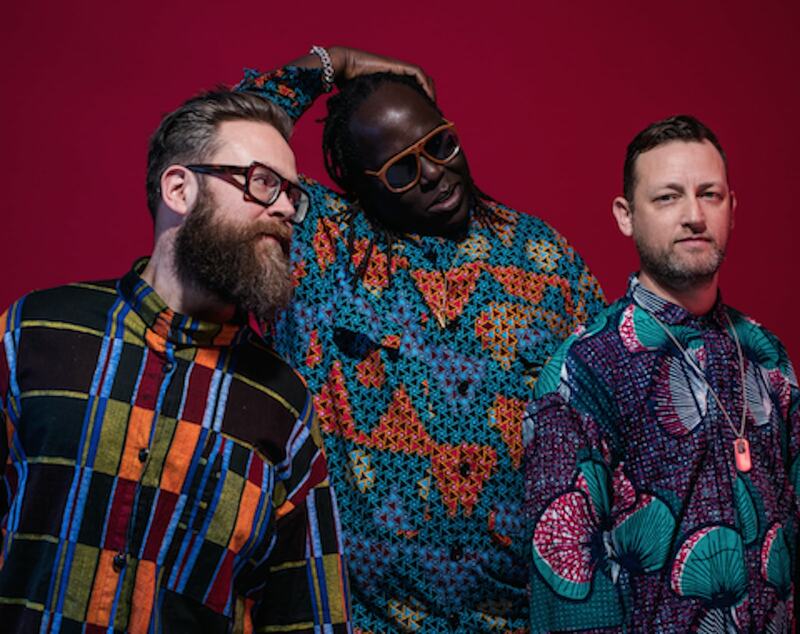 As a group, Dave Okumu (guitar, vocals), Tom Herbert (bass & synthesizer) and Leo Taylor (drums), have been involved in this celebration for almost a decade now, though their musical collaborations stretch back further still. The trio met as teenagers, and, over the next ten yeas or so, they crossed over again and again, gigging, jamming, working as session players and supporting each other’s band projects. It was only in 2006 that they coalesced as The Invisible. “We became a band backwards,” says Okumu. After a year out on the road playing in Matthew Herbert’s band, Herbert said he wanted to produce and release (via his label, Accidental) Dave’s solo record. But Dave instead decided to recruit his longtime friends for a genuine collaboration. The Invisible’s name arrived after the three began writing. The moniker is a nod to the writing of Irish philosopher and poet John O’Donohue, whose simply articulated notion that humans exist in parallel worlds – the visible and the invisible; one physical, one spiritual – is a relationship, a balance, that comes through loud and clear in the band’s aesthetic. The result of this first collaboration was their eponymous debut, which was nominated for the 2009 Mercury Music Prize and was many people’s tip to win it. It was also critics’ choice as iTunes album of the year. Unafraid to challenge themselves compositionally, The Invisible's boundless approach to arrangement flowed effortlessly between the texturally rich and the rhythm heavy, the ethereal and the visceral, taking in unique and subtle electronic dancefloor rhythms as well as deviations into experimental rock. It's a mixture that's won peer level praise from the likes of Radiohead's Ed O'Brien, Foals, Hot Chip, Wild Beasts, Anna Calvi and Everything Everything. Their second album, “Rispah,” was, in the words of Okumu,”a love letter to grief.” Mid-way through recording a follow-up to their debut, Okumu’s mother passed away and the band’s plans and aesthetic were thrown into turmoil. As Okumu remembers it, “I couldn't engage with music for a long period. The moment it returned to me was at my mum's funeral.” A group of women including Okumu’s grandmother began singing traditional spirituals: “It was the most beautiful sound I've ever heard… They were celebrating life and death, grief and hope, all things." The reception of the album was further complicated when Okumu was electrocuted while playing onstage in Lagos, Nigeria, which set back promotional and live activities while he recovered — it’s possible that his life was only saved because Tom removed the guitar from his hands. It’s certain that it was a hugely dangerous incident which he was lucky to survive. The album was, though, rapturously received, this “remarkable” record (The Times) being described as “an astonishing redemptive arc brighter than any rainbow” (Mojo) and “incredibly uplifting and moving” (Vice), amongst many other superlatives. The same year, Okumu became known for his production skills when the album he had overseen and written with Jessie Ware, “Devotion,” was a huge hit (and was nominated for a Mercury itself). But then this has never been a band who are content to focus on just one thing. Before Rispah even came out their credits included playing as a member of British post-jazz legends Polar Bear (Herbert) and drumming on much of Adele's world-crushing second album 21 (Taylor). They have also played live and recorded with a dizzying roll call of musicians that runs from St Vincent in the Tom Waits tribute 'Rain Dogs Revisited', the Britten Symphonia, Jack DeJohnette, Roots Manuva, Jamie Woon, Hot Chip, Zongamin, Gramme and many others. In the last two years alone, the whole band has played on the Adele smash “Sweetest Devotion” (from her all-time fastest selling album, “25”) plus Liane La Havas’ “Unstoppable.” Tom and Leo, in fact, were responsible for drum and bass on Adele’s “Skyfall”! In addition, Dave continued to feature as a co-writer/producer on Jessie Ware’s second album, ‘Tough Love,’ as well as the blockbuster “50 Shades of Grey” soundtrack. He has co-written and produced Rosie Lowe’s debut record, due out later this year through Wolftone/Polydor and continues his work as producer and writer with Grace Jones, Anna Calvi, Paloma Faith, Kwabs, Lilly Wood and Eska, amongst a number of artists. Dave and Tom collaborated on the 'In Dreams: David Lynch Revisited’ project, as well as taking part in a performance of “Double Fantasy” for Yoko Ono’s stint as curator of the Meltdown festival, closely followed by Beck's Song Reader project at the Barbican. Dave is also acting as musical director for The Gil Scott-Heron project for Convergence Festival. And as if all that wasn’t quite enough, Leo and Dave toured with the Floating Points band last year. “The band,” though “is the big itch. This is our vision.” Third album, “Patience,” grows out of all the experiences the group have had since Rispah, not least Dave’s post-electrocution sense that he is “the luckiest man alive, really. It would be really strange to make music that didn’t reflect that.” Joyous without losing any of its intelligence or compositional rigour, the basis for many of the tunes came from a couple of long trips Okumu made to LA, where he made connections in the West Coast beat scene and discovered “an ease and freedom that I plugged into.” Coming back to London, the trio worked on his basic compositions until they were a complete expression of the collective.